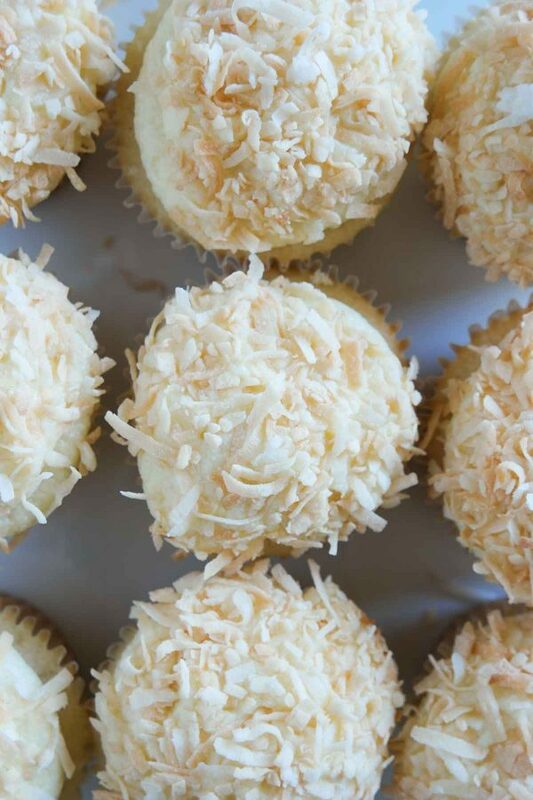 True coconut lovers will appreciate these Coconut Snowball Cupcakes! 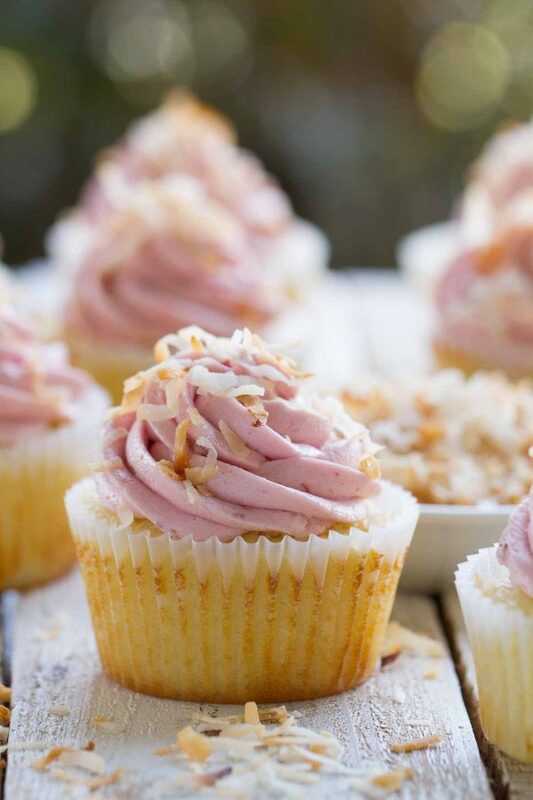 Coconut cupcakes are filled with a coconut pastry cream and then frosted with a coconut buttercream. 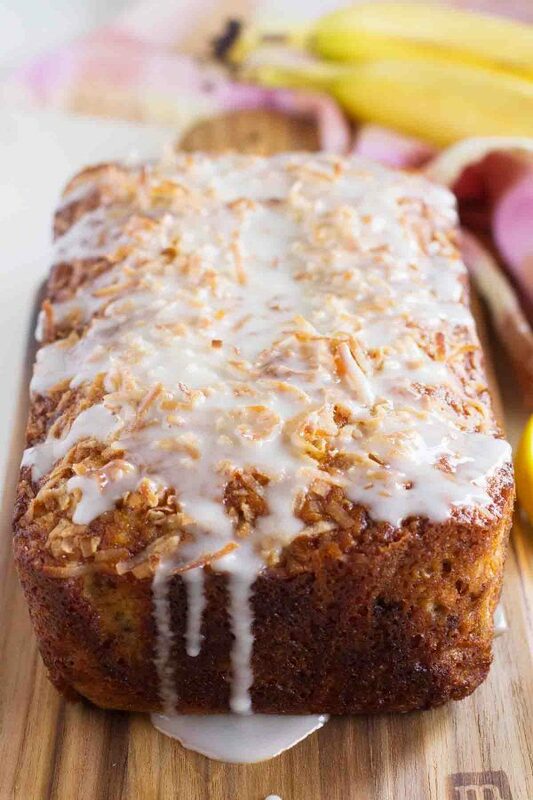 Top them off with toasted coconut for the ultimate coconut treat! Originally posted July 20, 2009 – It’s no secret that I’m a little bit coconut obsessed. So it goes without saying that these Coconut Snowball Cupcakes are the ultimate coconut recipe. 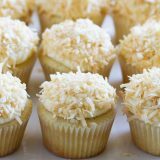 Coconut cupcakes are filled with a coconut pastry cream, then topped off with a coconut buttercream and toasted coconut. Coconut overload!! 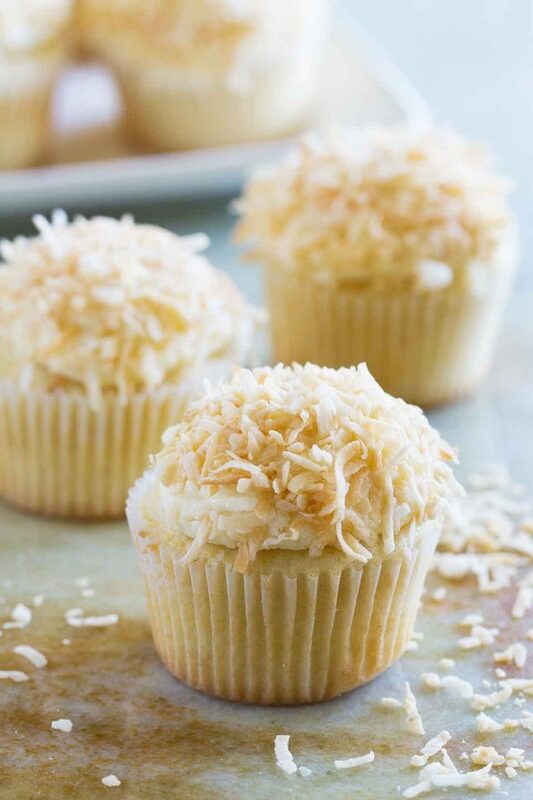 I’ve made several different coconut cupcake recipes over the years, but these are the ultimate coconut cupcakes! These Coconut Snowball Cupcakes may be a little more labor intensive than some other cupcakes, but trust me – they are worth it!! 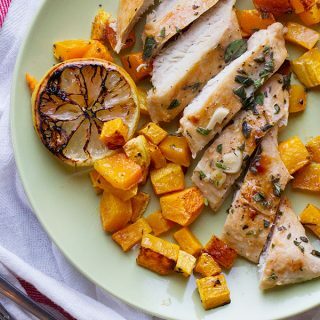 I really think that for the most part, my cooking is pretty “family friendly.” Even though my daughter is not even eating solids yet, so I’ve only been feeding my husband and I for the last few years, we tend to like less pretentious, every day kind of food. 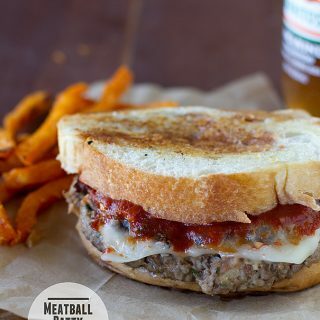 Sure, I like to challenge myself now and again, but day to day, I tend to be drawn towards the kind of food I grew up on. Well, a few months ago, we had an extended family get together to celebrate my grandparent’s anniversary. My sisters, mom and I were asked to bring desserts. One of the desserts I brought were these cupcakes. I had been wanting to make them, and I was excited to have the opportunity to do so. At the end of the party, my cupcakes had hardly been touched. Granted, there were about a bazillion desserts there, but I still wondered what happened and why no one wanted my cupcakes. I took them home, and the next night, my immediately family got together for family dinner. Since I had so many of these cupcakes, plus some of another cake I had made left over, I took them for dessert. I left early that night with a tired, crying baby, so I left behind all of my left over desserts. The next day, my mom told me how my dad had just raved about these cupcakes, and how every really liked them. I had eaten one (or two!) by this point and I loved them. So I wondered why no one wanted the cupcakes at the party. My mom came up with this answer. She said that she noticed that the kids all wanted cupcakes at the party, and the adults tended to go for cake. But there were some chocolate cupcakes, and those were the first to go. She thought that maybe these cupcakes were too sophisticated for the kids, and the adults were all too full on cake to try the cupcakes. I had a big laugh out of that, because I really don’t see my food as sophisticated. So maybe if you have some adults to bring a dessert to, these would go over better with them than with the kids!! Preheat the oven to 325ºF*. Line 2 12-cup cupcake pans with paper liners. Sift the cake flour, all-purpose flour, baking powder, baking soda and salt together into a large bowl. Set aside. In the bowl of a stand mixture fitted with the paddle attachment, beat the butter and the shortening together until creamy, 3 to 4 minutes. Add the sugar and the vanilla and continue to beat on medium for 3 more minutes. Scrape the bowl, then add the egg and beat until combined. Turn the mixture to low and add 1/3 of the flour mixture, followed by half of the ice water, another 1/3 of the flour, the remaining water, then the remaining flour. Scrape down the bowl and mix a few more seconds on low to combine. 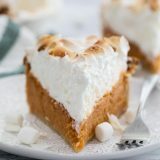 In a clean bowl, whisk the egg whites and the cream of tartar until soft peaks form. 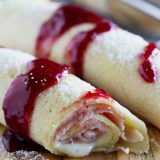 Gently fold the egg whites into the batter. 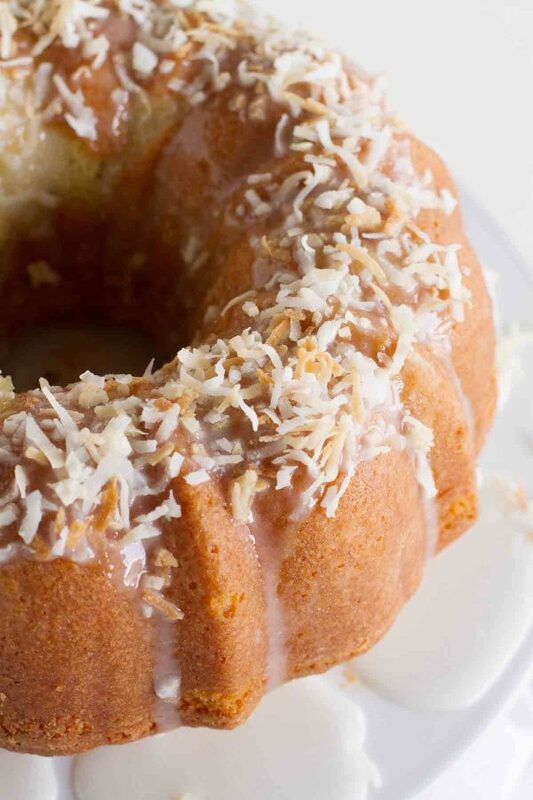 Fold the coconut into the batter. Fill the cupcake liners 2/3 full of the batter. Bake until a tester inserted in the center comes out clean, 20 to 25 minutes, rotating the pans half-way through the baking time. 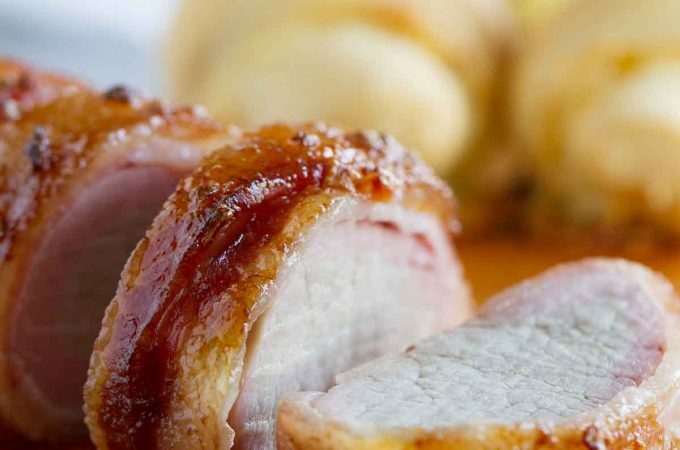 Transfer the pans to a wire rack to cool for 20 minutes, then remove from the pans and allow to cool completely. 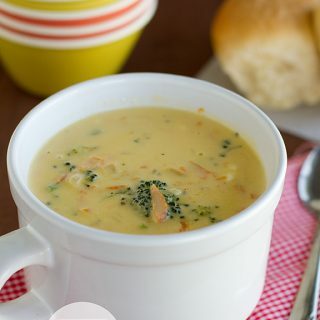 Bring the half and half to a simmer in a medium saucepan over low heat. Add the coconut then place a cover on the pan and simmer for 20 minutes to allow the coconut to steep. Strain and discard the coconut. In a medium bowl, whisk the egg yolks with the sugar, flour and salt until the mixture is pale, about 1 minute. Whisk half of the warm half and half into the egg yolk mixture, then pour that into the saucepan with the remaining half and half. Cook over medium heat, stirring constantly, until thickened, about 6 minutes. Remove the pan from the heat and stir in the vanilla. Strain the cream through the sieve. Press a piece of plastic wrap over the surface of the cream and refrigerate for about 1 hour, or until completely cooled. In a medium, heavy saucepan, combine the sugar and the flour and whisk together. Add the milk and the cream and cook over medium heat, whisking occasionally, until it comes to a boil and thickens, about 20 minutes. Transfer the mixture to the bowl of a stand mixer fitted with the paddle attachment. Beat the mixture on high speed until cool. Reduce the speed to low and add the butter, one piece at a time, and continue to mix until thoroughly incorporated. Increase the speed to medium-high and beat until the frosting is light and fluffy. Cut a cone out of each of the cupcakes and fill with about 1 teaspoon of the coconut pastry cream. Replace the top of the cone. 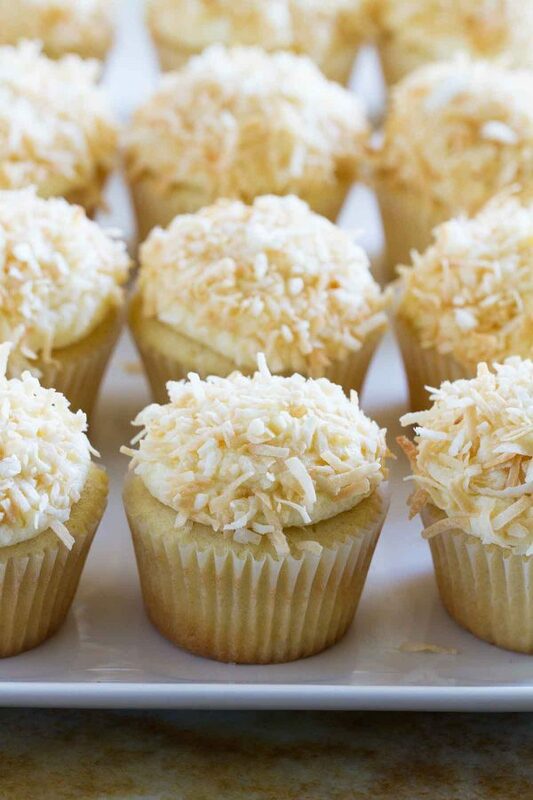 Frost each of the cupcakes with the frosting, then dip the tops into the toasted coconut. 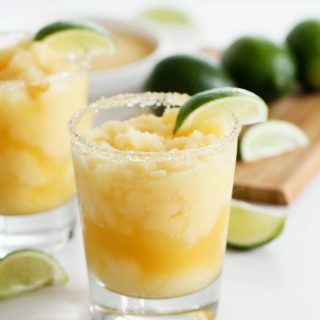 *For high altitude for the cupcakes, I subtracted 1/2 teaspoon baking powder, subtracted 3 tablespoons of sugar, and added 2 tablespoons of ice water. I also increased the temperature by 25º. I think I would have definitely tried one of them. I wouldn't have been able to resist, full or not. 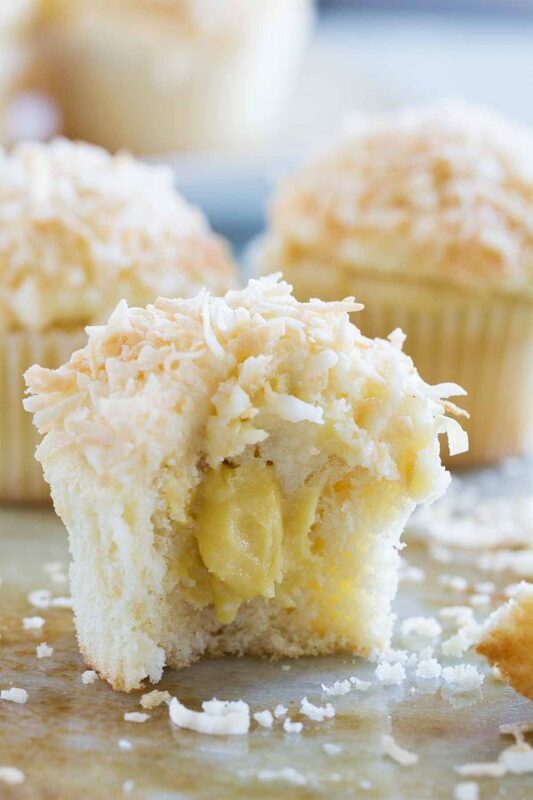 I adore coconut cake, so will love these cupcakes! Well I certainly would've gone for these cupcakes :)! To me, they look cute and not too fancy at all. I think I'll have to agree withe the second comment, sometimes coconut can be too exotic for some kiddos? But I can't imagine a better cupcake for a summer gathering :)! These are a lovely cupcake! Put a gummy worm on them, and the kids will go for 'em! OMG. 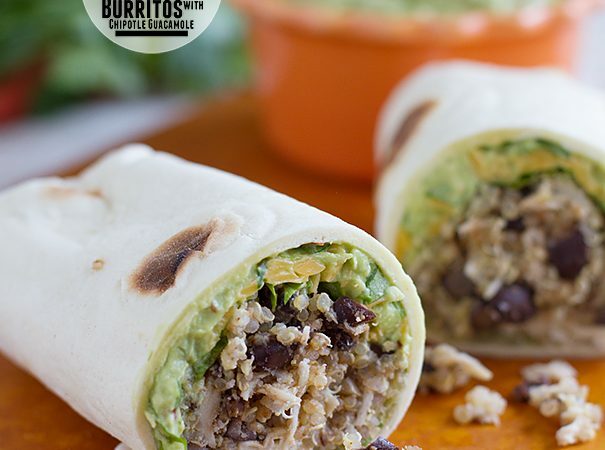 These look simply heavenly! Oh you know I'm all over these! First of all, I am the cupcake queen. Second, I adore coconut!!! If I'd been around Deborah, you'd have caught me stuffing cupcakes into my purse, my husband's pockets, my blouse…*sigh*. That is so strange! I guess there is still something child-like about me since I actually prefer cupcakes to a piece of cake anytime. I don't know too many kids that are into coconut. These sound yummy though. I love filled cupcakes. It's a lovely surprise. Those are gorgeous cupcakes! I would have preferred these over the chocolate cake, I think. I'm such a huge fan of coconut. They look delicious. 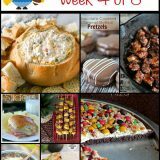 I've wanting to make this recipe but for some reason (too many steps, maybe?) have not been able to get motivated enough. Thanks for letting me know that they are worth the extra effort. I bake a lot for children and find that many of them are put off by shredded coconut even those that like coconut. It takes some cajoling to get 'em to give it a try. that last bit was supposed to read "i never resist a cupcake"
P.S. Thanks for sharing my brownies! Thanks, Allison, and you’re welcome – they look amazing!